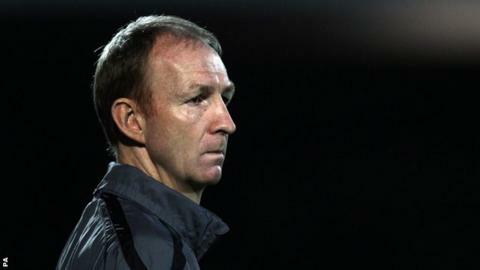 Torquay United have appointed former Scunthorpe boss Alan Knill as interim manager at Plainmoor. The 48-year-old will take charge of the first team until the end of the season in the absence of permanent boss Martin Ling, who is currently on sick leave. Knill, who has been out a job since his departure from the Iron in October, will be assisted by Shaun Taylor. "We're delighted he's decided to come in and help us," Gulls chairman Simon Baker told the club website. "He comes across as a very agreeable man but there is an edge of steel in him, which is what we need. ''He also has very good contacts, and during his time with Bury he built up a good relationship with Manchester United and Everton. "It would be no surprise to see some loan players come in to help us out." Ling has been absent from his post for the last six Torquay games, leaving his assistant Taylor to oversee the first-team. However, having endured a run of five defeats in a row, the Gulls have brought in Knill to try to save the side - who sit 19th in League Two - from relegation from the Football League. Former Bury and Rotherham boss Knill's most recent job was with Scunthorpe, but earlier this season he was replaced by Brian Laws at Glanford Park after a run of seven games without a win. The former Wales international comes into the Plainmoor position in difficult circumstances, but Baker did have an update on Ling's condition. ''The last I heard from Mrs Ling was that Martin is making progress and we will see how it all pans out," said Baker.